This story follows the journey of Stick Man trying to find his way back home after being torn away from his family. There are many dangers of being a Stick Man - dogs want to play, swans want to build nests and people make fires using sticks! Just as it seems that all hope is lost, Stick Man gets rescued by none other than Santa Clause, who helps him find his way back home. 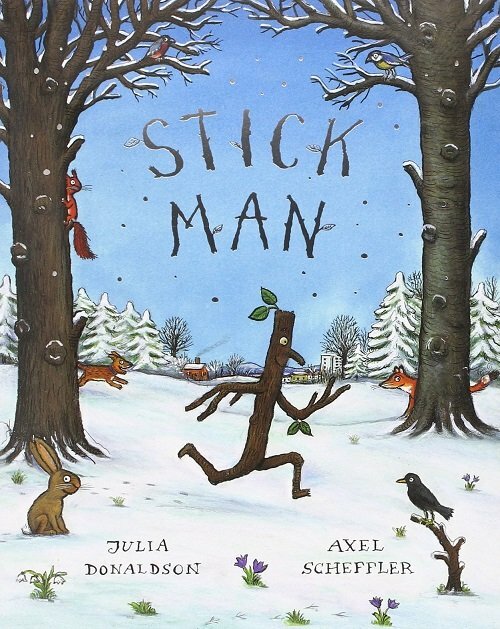 Stick Man is a cute story with a simple and repetitive rhyming scheme, which allows children to join in and identify the rhyming words in the story. As with most of Axel Scheffler’s illustrations, the pictures tell their own tale and truly bring the story to life. Children love studying the detail and can be encouraged to describe what they can see using a range of action verbs. The repetitive nature of the story makes it an ideal choice for working on grammar targets, particularly negatives (e.g. “I’m not a stick,” “I’m not a twig,” “I’m not a pen,” etc.) and subjective pronouns (e.g. “I’m Stick Man”, he is floating, he is in the chimney). This is also a fantastic book for working on /s/ blends - see the list below for some words to target. For further speech and language goals to target using Stick Man, see the list below.